Honda has officially started taking bookings for the Amaze at its 150 dealers in 90 cities around India. The car is scheduled for a launch on April 11, and Honda’s website has a tell-tale countdown clock to the launch. As of now there is no clarity on the number of variants that the Honda Amaze would come with, as that information wasn’t shared. We know for sure there will be three engine and power-train options for the car. First up is the Honda Amaze 1.5-litre iDtec diesel engine that puts out 100PS (98.6 bhp) of power at 4000 rpm and 200 Nm of torque at 1750 rpm. This engine will come only with a five-speed manual transmission option. Fuel efficiency is a claimed 25.8 kmpl. The diesel will come in three trim variants, all of which will have ABS and EBD as standard features. We expect Honda to introduce an S-MT, V-MT and VX-MT, with prices for the diesel starting at about Rs. 6.3 lakh and going up to about Rs. 7.9 lakh, at a slight premium to the Maruti Dzire. Also see: Honda Amaze VX Diesel vs Maruti Suzuki Dzire ZDI: Features and specs compared! The petrol Amaze will be powered by a 1.2 litre four-cylinder petrol engine putting out 87 bhp of power and 109 Nm of torque. This engine will come with a choice of either a five-speed manual transmission or a five-speed automatic transmission. The automatic has a claimed mileage of 15.5 kmpl, while the manual transmission variant has a claimed mileage of 18 kmpl. The petrol Amaze is likely to come in four variants, starting with an S-MT, V-MT, VX-MT and VX-AT, with prices starting at about Rs. 5.3 lakh, going up to Rs. 6.5 lakh, again with a slight premium to the Maruti Dzire line up. 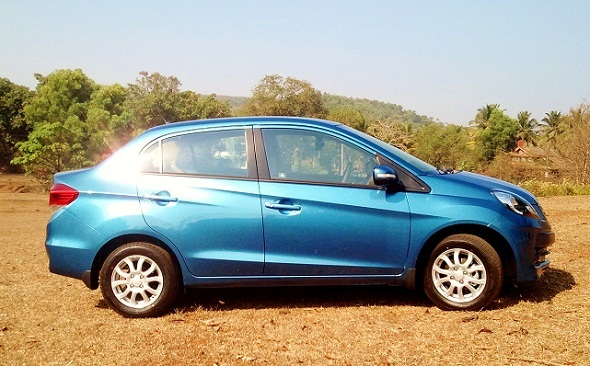 Share your thoughts on the Honda Amaze – what do you think Honda should price it at? Would a slight premium to the Maruti Dzire work?